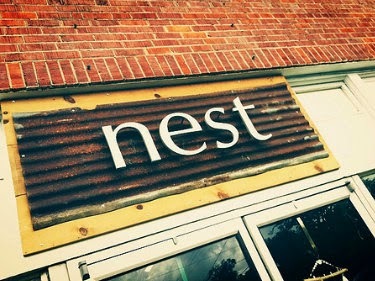 Cottage Nest - Crafting A Handmade Life: Care to Stitch? I swear, I am my own best, worst customer...a few months back I started seeing all of my stitching friends on instagram with these beautifully crafted wooden thread organizers for cross stitch and gasp I needed one - then I figured, if I was ever so entranced by them, perhaps others would be too. So, I ordered a whole slew of them! Ahh...the piece de la resistance. I think this pretty fleur de lis thread organizer is what sold me. Clean lines, pretty vintage imagery and quite useful! Always a cat lady sigh, I could not resist this sweet tabby. Dear kitty holds up to 14 colors...good girl! Ooh la la, the Eiffel Tower is super fancy and another exceptional caddy holding up to 14 colors. I don't wanna stitch unless you got buns, hun. Hoppy stitching all the way with this fella! Lastly, for this order...I commissioned a vintage style strawberry - since we are in Ponchatoula - the self-appointed strawberry capitol of the world. All are now available in the pattern and supply section of my Etsy shop. I am still developing a retail nook for my cross stitch patterns and supplies within our existing gift shop. Rather than every other person say "what are deese fer", I have them behind the counter...but please ask if you are in town! I have big hopes that I'll develop my stitchery and make new local friends where we all sit, stitch...and live happily ever after right? I should mention, if you, like me, are a lonely stitcher - Emily with Steotch let me know they are building a forum to connect with other stitchers. YAY! We will be able to share work, ideas, and as you can guess if Steotch is involved, I imagine a lot of hilarity too! 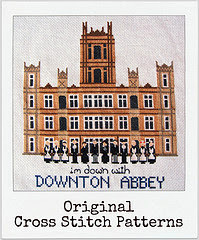 Already you can see many great original cross stitch designs in the Needle Sharing Gallery...they so kindly shared my first Downton Abbey Cross Stitch Pattern. Please check out their site and keep watch for the next Mystery Stitchalong in June!